This arcade port is a classic but expensive. RayStorm is a port of a scrolling arcade shooter from 1996 and it definitely feels like something from a different time. On one hand, this distinction from other App Store games makes it refreshing in a way. However, its arcade roots come with a host of issues that make it a tough sell especially at its current price. Anyone who bothers reading the last two pages of the digital manual will learn about some sci-fi nonsense plot about intergalactic civil wars and stolen spaceships but it’s really just an excuse to fly around futuristic environments blowing stuff up. The game is actually a sequel to RayForce but not in terms of plot. 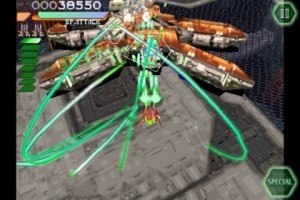 Rather, RayStorm is a 3D realization of RayForce’s 2D gameplay and visual style. Speaking of those visuals, while they do run smoothly and feature an impressive amount of action going on at any given moment, they are also chunky and blurry, betraying their early PlayStation 1-era roots. However, between the lightning guns and the giant eyeball robot monsters and the cosmic valley landscapes, there are still plenty of interesting things to look at all while listening to the delightfully quirky Japanese jazz soundtrack. The gameplay is standard shoot ‘em up fare. Players have two different ships to choose from and there’s a decent amount of customization whether it’s choosing shot type or lock-on method. The seven stages won’t take too long to complete but this is a genre about replaying for high scores. It’s also a genre about high difficulty and precise movement but the touch controls work miraculously well. Wherever players rest their thumbs become virtual joysticks and steering the ship from there is a breeze. The game features a new, iPhone-optimized version that supposedly changes up enemy placement for the player’s benefit. However, the unchanged original version of the game plays better than expected with these new controls too. This is a fine way to play a fine old game but to be clear, RayStorm is undeniably an old game. Search the App Store long enough and one is sure to find a cheaper, modern equivalent.